The Airco DH.9 (from de Havilland 9) – also known after 1920 as the de Havilland DH.9 – was a British single-engined biplane bomber developed and deployed during the First World War. The DH.9 was a development of Airco's earlier successful DH.4, with which it shared many components. These were mated to an all-new fuselage and the BHP/Galloway Adriatic engine, which promised increased performance. Anticipating its usefulness, the type was ordered in very large numbers for Britain's Royal Flying Corps (RFC). Upon entering service, the DH.9's performance was found to be unsatisfactory. The Adriatic engine was unreliable and failed to provide the expected power, which gave the DH.9 poorer performance than the aircraft it had been meant to replace. The performance deficit was blamed for the heavy losses they suffered over the Western Front. The redesigned DH.9A was fitted with a more powerful and reliable American Liberty L-12 engine which rectified the shortcomings of the original DH.9 model. During June 1917, partially as a result of attacks by German bombers on London, the War Office issued its recommendation to almost double the size of the Royal Flying Corps (RFC) to a total of 200 squadrons. In early July 1917, the British Cabinet accepted the recommendation, with the intention that the majority of the new squadrons planned to be equipped with bombers. While an order for 700 DH.4s was placed on 28 June 1917, on 23 July 1917, the Air Board were presented with drawings for a modified DH.4 that delivering greater range under a new type number, DH.9. The DH.9 was designed by de Havilland for the Aircraft Manufacturing Company in 1916 as a successor to the DH.4. It used the wings and tail unit of the DH.4 but featured a modified fuselage which moved the pilot closer to the gunner/observer and away from the engine and fuel tank, which facilitated communication and was a more optimal fighting configuration. The other major change from the DH.4 was the choice of the promising new BHP/Galloway Adriatic engine, which was predicted to produce 300 hp (224 kW) to provide adequate performance to match enemy fighters. Based on the performance estimates for the DH.9 (which were initially expected to surpass those of the DH.4), and the similarity to the DH.4, which meant that it would be easy to convert production over to the new aircraft, it was decided to place a massive number of orders (totalling 4,630 aircraft) for the type prior to the aircraft even flying for the first time. Existing contracts originally placed for the DH.4 were also converted to the DH.9. The Air Board had been specifically assured that there would be an initial production delay of no more than a month. According to aviation author J.M Bruce, the selection of the DH.9 "seems to have been taken in a spirit of optimism or blind faith, for its chosen engine was, in July 1917, experiencing serious manufacturing difficulties". In July 1917, the prototype (a converted DH.4) performed its maiden flight from Hendon Aerodrome, Colindale, London. Trials of the type were extensive, including a number of tests performed at RAF Martlesham Heath. Unfortunately, the BHP engine proved unable to reliably deliver its expected power; the engine having been de-rated to 230 hp (186 kW) in order to improve its reliability. This deficit had a drastic effect on the aircraft's performance, especially at high altitude, with it being inferior to that of the DH.4 it was supposed to replace. The poor performance of the aircraft meant that the DH.9 would have to fight its way through enemy fighters, which could easily catch the DH.9 where the DH.4 could avoid many of these attacks. As early as November 1917, some officials, such as General Hugh Trenchard, raised repeated objections to the aircraft based upon its disappointing performance; however, in his response, President of the Air Council Sir William Weir started that "it was the choice of having the DH.9 with the B.H.P. engine, or of having nothing at all. Additionally, by this point, production of the DH.9 was already well underway. Multiple attempts were made to provide the DH.9 with an adequate engine; a number of aircraft were powered by the Siddeley Puma, a lightened and supposedly more powerful version of the BHP. In August 1917, an order for 2,000 Fiat A12 engines was placed, intending to be delivered between January and June 1918 and used upon some production batches of the D.H9; however, deliveries of the Fiat engine were unsatisfactory. Another alternative powerplant was adopted in the form of the 430 hp (321 kW) Napier Lion engine; one such Lion-engined aircraft achieved a World Altitude Record of 30,500 ft (13,900 m) on 2 January 1919. However, none of these options were deemed to be entirely satisfactory, it required being redesigned into the DH.9A, for which an American V-12 Liberty engine was adopted, to transform the aircraft. According to Bruce, aside from the engine issue: "Certainly, there was little wrong with the aircraft itself". The Airco DH.9 was a single-engine British bomber aircraft, sharing a high level of similarities with the preceding DH.4. The standard flight surfaces were broadly the same, but adopted a highly redesigned fuselage configuration, including the repositioning of the pilot's cockpit to a more rearwards position. Structurally, the fuselage was similar to its predecessor; plywood cladding covered the forward fuselage, which had no internal bracing, while a conventional wire-braced box girder structure was used aft of the cockpits. Internal stowage for a pair of 230 lb or four 112 lb bombs was provided for, although there was little use of this capability operationally. While the DH.9 was deemed to be suitable for daytime bombing operations, it was found to be incapable of effective nighttime bombing due to the pilot's view being obstructed and visibility via the bombsight being unsuitable. The revised cockpit positioning of the DH.9 from the DH.4 placed the pilot and the observer closer together, which was viewed by the RAF as being a considerable advantage in aerial combat; however, the pilot's visibility for ground reconnaissance was decreased as a result. Both radio sets and cameras could be installed. The fuel tanks were enclosed in doped fabric, intended to drain fuel away if the tanks were hit by enemy fire. According to the testing squadron, the DH.9 possessed a high level of manoeuvrability, was relatively easy to perform landings aside from a poor view during the approach. Various improvements and supplementary equipment were trialled and occasionally adopted. Tests of various engines, radiators, silencers and parachutes were conducted to evaluate their performance, however, few of these improvements were ultimately adopted. During the war, numerous customisations and improvised improvements were made to the aircraft by the maintenance crews of individual squadrons, often for the purpose of addressing the type's engine performance issues. After the end of the war, many DH.9s, which had been originally delivered as bombers, were sold; these were often reconfigured to serve in different roles, including passenger and cargo transport, trainer aircraft, and as air ambulances. To boost the rate of production, quantity orders for the DH.9 were also placed with Alliance, G & J.Weir, Short Brothers, Vulcan, Waring & Gillow and National Aircraft Factories No. 1 and No. 2. 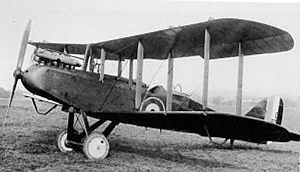 The first deliveries of the type occurred during November 1917 to 108 Squadron RFC; by the end of 1917, a total of five DH.9s had been delivered and passed their final inspections. The first combat engagement of the type, performed over France, was performed in March 1918 by 6 Squadron. By July 1918, a total of nine operational squadrons deployed to the Western Front were using the type. The DH.9's performance in action over the Western Front was typically deemed to have been a disaster; heavy losses of the type were quickly incurred, attributed to both its poor performance and to engine failures, despite the prior derating of its engine to reduce the failure rate. Between May and November 1918, a pair of squadrons stationed at the Western Front (Nos. 99 and 104) had 54 of its DH.9s shot down and another 94 aircraft written off due to accidents. On multiple occasions, less than half of a flight of bombers would reach their intended targets; according to Bruce, the successful missions performed by the DH.9 were frequently a product of "the courage and determination of the pilots and observers that flew them". Squadrons would often implement their own home-built enhancements to their aircraft, such as enlarged carburetor air intakes and modified fuel mixture controls. Nevertheless, the type proved capable during some engagements; on 23 August 1918, a DH.9 flown by Lieutenant Arthur Rowe Spurling of 49 Squadron, with his observer, Sergeant Frank Bell, single-handedly attacked thirty Fokker D.VII fighters, downing five of them. On 9 August 1918, Lieutenant E.A. Simpson of 49 Squadron, while flying a bombing mission upon bridges at Falvy and Bethencourt, shot down four hostile fighters while defending against repeated attacks upon the formation. In another instance, Captain John Stevenson Stubbs achieved 11 aerial victories in a DH.9, including the highly unusual feat of balloon busting while flying the type. Despite its general lack of performance, due to its large numbers, the DH.9 was introduced to nearly every theatre of the conflict prior to the signing of the Armistice of 11 November 1918, which ended the conflict. Reportedly, the DH.9 was also more successful in combat against the Turkish forces in the Middle East, where they faced less aerial opposition. Stationed at coastal aerodromes across the British mainland, the type was also used extensively to perform coastal patrol missions with the aim of deterring the operations of enemy U-boats. Following the end of the First World War, a number of DH.9s operated by 47 Squadron and 221 Squadron were sent to southern Russia in 1919 in support of the White Russian Army of General Denikin, participating in the Russian Civil War. In this theatre, the aircraft were often operating within challenging conditions. The last combat use of the DH.9 by the RAF was in support of the final campaign against Mohammed Abdullah Hassan (known by the British as the "Mad Mullah") in Somalia during January–February 1920. Amongst those aircraft used in Somalia, one DH.9 was modified to function as an air ambulance, being able to load and transport a single stretcher case, which was carried upon the upper longerons directly to the rear of the pilot's cockpit. Further ambulance conversions were performed, including a number that were operated by the Royal Netherlands Air Force. Surprisingly, production was allowed to continue after the end of the war into 1919. In 1920, the DH.9 was finally withdrawn from service by the RAF. In addition to British manufacturing, several other countries had commenced production of the type; perhaps the most significant of these was the Airco DH.9A, which was fitted with the American V-12 Liberty engine, and was produced in the thousands even though production was curtailed by the signing of the Armistice that had ended the First World War. Belgium and Spain also produced the type, the latter producing hundreds of the type equipped with a 300 hp Hispano-Suiza engine; some of these were still in service in 1940. Following the end of the conflict, large numbers of surplus DH.9s became available at low prices and the type was widely exported; this included those aircraft that were donated to Commonwealth nations as part of the Imperial Gift programme. The South African Air Force (SAAF) received a total of 48 DH.9s, and used them extensively, including against the Rand Revolt in 1922. Several South African aircraft were later re-engined with Bristol Jupiter radial engines as the M′pala; such modified aircraft continued to serve until 1937. After the end of the war, large numbers of surplus DH.9s became available, having been deemed to be surplus to requirements by their original military operators; accordingly, many were resold onto civil operators, such as by early aerial transport companies. Large numbers were modified to better perform as transport aircraft, such as the cabin being suitably adapted for the carriage of passengers. In this role, the DH.9 provided a useful load carrying capability and was relatively inexpensive to procure. Accordingly, in various configurations, the type saw prolific use by civil operators. Early air services between London, Paris and Amsterdam were operated by a fleet of DH.9s owned by Aircraft Transport and Travel. A number of DH9s were converted into floatplanes and saw use in India, Bolivia and Rhodesia. Several aircraft were reconfigured to serve as trainer aircraft, being refitted with Armstrong Siddeley Jaguar engines and rubber undercarriages; designated as DH.9Js, the last of these were withdrawn and scrapped in 1936. A number of different DH.9 conversion programmes for civil use were carried out, both by Airco and its successor, the de Havilland Aircraft Company, and by other third party companies, such as the Aircraft Disposal Company. Some radial powered DH.9Js continued in civil use until 1936. DH.9 – Revised version of the DH.4 with the pilot and observer/gunner placed closer together (3,024 production aircraft built with others built in Belgium and Spain). DH.9A – (also referred to as the Nine-Ack) was designed for Airco by Westland Aircraft to take advantage of the 400 hp (298 kW) American Liberty L-12 engine. Apart from the new engine and slightly larger wings it was identical to the DH.9. Initially it was hoped to quickly replace the DH.9 with the new version, but the shortage of Liberty engines available to the RAF limited the new type's service in the First World War, and it is best known as a standard type in the postwar RAF, serving as a general purpose aircraft for several years. 2,300 DH.9As were built by ten different British companies. DH.9J – Modernised and re-engined conversions using the 385 hp (287 kW) Armstrong Siddeley Jaguar III radial engine. Used by the De Havilland School of Flying. DH.9J M'pala I – Re-engined conversions carried out by the South African Air Force. Powered by a 450 hp (336 kW) Bristol Jupiter VI radial piston engine. M'pala II – Re-engined conversions carried out by the South African Air Force, powered by a 480 hp (358 kW) Bristol Jupiter VIII radial piston engine. Mantis – Re-engined conversions carried out by the South African Air Force, powered by a 200 hp (149 kW) Wolseley Viper piston engine. Handley Page HP.17 – A DH.9 experimentally fitted with slotted wings, tested 1920-1. Afghan Air Force – 18 aircraft, including 16 built by Duks Aircraft Works, acquired from 1924. Royal Australian Air Force – One used by the RAAF from 1920 to 1929. Belgian Air Force – 18 aircraft. Chilean Air Force – Received 20. Estonian Air Force operated 13 from 1919 to 1933 . The Kingdom of Hejaz received 9 DH.9s and 2 DH.9Cs between 1921 and 1924. Five remained in existence (although not airworthy) in 1932. Royal Netherlands East Indies Army Air Force – operated 36, some of which were re-engined with Pratt & Whitney Wasp radial engine withdrawn in 1934. Royal New Zealand Air Force – Three Airco DH.9s in service with the New Zealand Permanent Air Force from 1923 to 1929 as advanced training aircraft. Polish Air Force – 20 received in 1920, used during the Polish-Soviet war, until 1929. South African Air Force – Part of the Imperial Gift. Some locally modified with Jupiter engines and named Mpala. Turkish Air Force – four aircraft, in service from 1921 to 1924. Of the thousands of DH.9s built, only a few have survived to be preserved. F1258 is displayed at the Musée de l'Air et de l'Espace in Paris, with a second DH.9 being preserved at the South African National Museum of Military History, while G-EAQM, the first single-engined aircraft to fly from the United Kingdom to Australia is preserved in the Australian War Memorial at Canberra. The remains of three DH.9s were discovered in India in 2000, one of which is displayed at the Imperial War Museum Duxford, and another is in the process of being restored to flying condition. ^ Bruce 2 April 1956, p. 387. ^ a b c d e f g h Bruce 1965, p. 3. ^ a b c d e Bruce 1965, p. 4. ^ a b Jackson 1987, p. 97. ^ a b Bruce 1965, pp. 3-4. ^ a b c Jackson 1987, p. 100. ^ a b Bruce 1965, pp. 4-5. ^ a b c Bruce 1965, p. 5. ^ Bruce 1965, pp. 7-8. ^ Bruce 1965, pp. 6-8. ^ Bruce 1965, pp. 8-10. ^ a b c Bruce 1965, p. 6. ^ Mason 1994, p. 84. ^ Lt. Spurling Won Flying Cross, The Royal Gazette and Colonist Daily (now The Royal Gazette), Hamilton, Bermuda. 19 September 1918. ^ a b c Bruce 1965, p. 7. ^ "John Stevenson Stubbs" theaerodrome.com, Retrieved: 1 May 2011. ^ a b Bruce 13 April 1956, p. 424. ^ a b Bruce 1965, p. 8. ^ Bruce 1965, pp. 8-9. ^ a b c d e f Bruce 1965, p. 9. ^ a b Mason 1994, p. 86. ^ Jackson 1987, p. 102. ^ Bruce 1965, pp. 9-10. ^ Bruce 1965, p. 10. ^ Jackson 1973, pp. 50-52. ^ Jackson 1973, p. 56. ^ Barnes 1976, pp. 211–213. ^ "From Huffman Prairie To The Moon, The History of Wright-Patterson Air force Base" (PDF). WADC/WADD Digital Collection at the Galvin Library, IIT. 1986. pp. 184–186. ISBN 978-0160022043. Archived from the original (PDF) on 20 February 2016. Plans called for the Curtiss Aeroplane and Moto Corporation of Buffalo, New York, to manufacture 4,000 USD-9As. The order was cancelled, however, when Allied victories in France during the summer of 1918 forecast Germany's ultimate defeat...at least four USD-9A airplanes were manufactured at McCook, but none were built by a contractor. ^ Bruce 13 April 1956, p. 423. ^ Gerdessen 1982, p. 76. ^ a b Bruce 13 April 1956, p. 425. ^ Andersson Air Enthusiast July/August 2004, pp. 39–42. ^ "DH.9." Musée de l'Air et de l'Espace. Retrieved: 11 April 2008. ^ Blake, Arthur. "Colours in the Sky." Military History Journal, Vol 1, No 6. June 1970. The South African Military History Society. Retrieved: 11 April 2008. ^ Jackson 1987, p. 125. ^ "AWM Collection Record: P02270.029." Archived 28 September 2011 at the Wayback Machine Australian War Memorial, Retrieved: 11 April 2008. ^ "In pictures: 'Elephant stable' bomber." BBC News, 21 April 2007. Retrieved: 11 April 2008. ^ "DH-9." Historic Aircraft Collection Ltd, Retrieved: 11 April 2008. ^ Bruce 1965, pp. 10, 12. Andersson, Lennart. "Wings Over the Desert: Aviation on the Arabian Peninsula: Part One Saudi Arabia". Air Enthusiast, No. 112, July/August 2004. pp. 39–43. ISSN 0143-5450. Barnes, C.H. Handley Page Aircraft since 1907. London:Putnam, 1976. ISBN 0-370-00030-7. Bruce, J. M. "Aircraft Profile No. 62: The de Havilland D.H.9". Profile Publications Ltd, 1965. Bruce, J.M. "The De Havilland D.H.9: Historic Military Aircraft: No. 12, Part I". Flight, 6 April 1956. Pages 385–388, 392. Bruce, J.M. "The De Havilland D.H.9: Historic Military Aircraft: No. 12, Part II". Flight, 13 April 1956. Pages 422–426. Gerdessen, F. "Estonian Air Power 1918 – 1945". Air Enthusiast No 18, April – July 1982. Pages 61–76. ISSN 0143-5450. Jackson, A.J. British Civil Aircraft since 1919 Volume 2. London:Putnam, Second edition 1973. ISBN 0-370-10010-7. Jackson, A.J. De Havilland Aircraft since 1909. London: Putnam, Third edition 1987. ISBN 0-85177-802-X. Winchester, Jim, ed. Bombers of the 20th Century. London: Airlife Publishing Ltd., 2003. ISBN 1-84037-386-5. Wikimedia Commons has media related to Airco DH.9. This page was last edited on 17 April 2019, at 17:01 (UTC).